As we reported earlier, WhasApp started banning WhatsApp+ users for 24 hours and sent a cease and desist letter to the developer. After the 24 hour ban expired, some users either did not uninstall the unofficial client or tried installing it again. For a short while after the ban ended, users who tried the unofficial client reported it as working fine. There was also at least one user report that attempting to alter the phone’s date or time also extends an existing 24 hour ban to 72 hours. 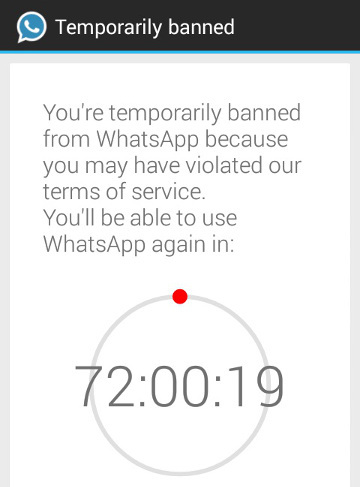 The 72 hour ban also applies if previously banned users try using WhatsappMD, which is another unofficial app. According to BBC News, the Facebook-owned message service claims that unofficial WhatsApp apps may lead to data being leaked to third parties or create other issues such as losing messages. The service is now taking aggressive action against unauthorised apps. The WhatsApp Plus app has been in development since 2012 and is reported to have been downloaded over 35 million times. Its features not available in the official app include the ability to use colours, background images, attach longer sound and video files and hide the last logged in status from others. The WhatsApp+ author has just announced that it will be shutting down its Google+ community in the coming hours and that it has created a new community AppPlus for those who would still like to keep in touch with the author. All posts and discussions relating to WhatsApp+ are banned on the new community. Some fans of WhatsApp+ have asked the author to create a similar App based on the open source messaging app Telegram, however the author said that it can’t comment on any future plans for now.